They seem to be a shape I've been drawn to my whole life long. Given the choice of an oval or heart-shaped locket for a graduation gift from my parents...I chose the heart. For our first Christmas together as a married couple, I made ornaments for our tree...most of them were heart-shaped :) I even used a small piece of leftover material from the bridesmaid dresses to create one of the hearts. I often sign my name by using a small heart to dot the "i". So when I was shopping for items for my children's Valentine's baskets one year (yes, they don't just get chocolate! 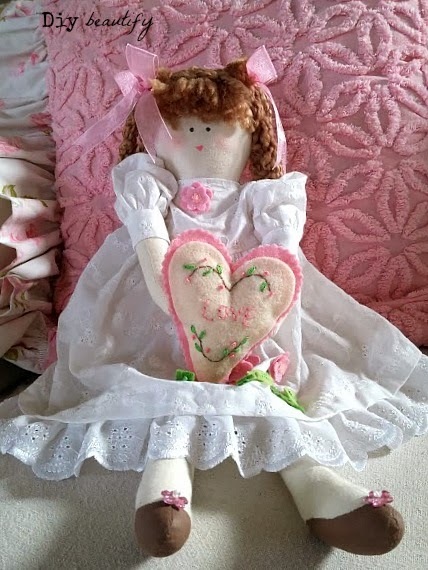 )...I spotted this little doll with a heart in her hands...and bought it for Little Diy. Looking at it, I knew it would be a simple process to make a few. 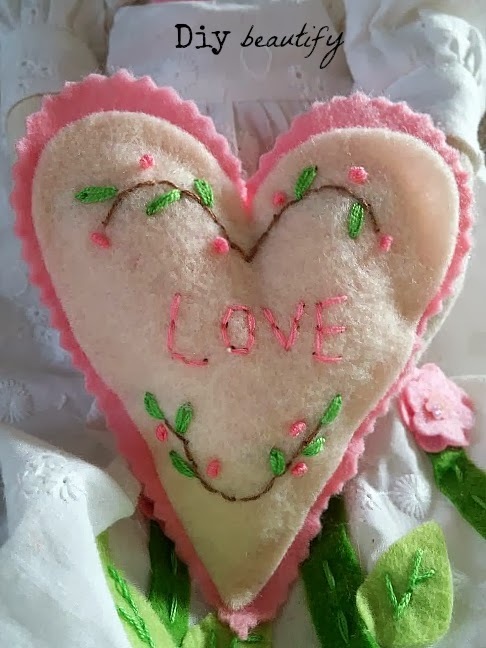 I pulled out my pink and cream felt, cut various sized heart shapes using pinking shears, and hand-stitched them with DMC floss. Super simple. I made all three in about an hour. 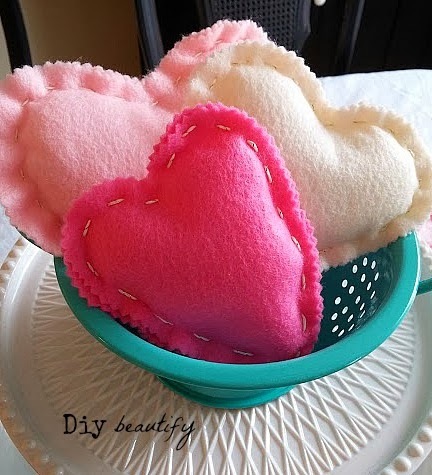 - To get a perfect heart shape, fold one piece of felt over like I did here. Cut out one heart and then trace it onto another piece and cut it out so you have two equal pieces. Pinking shears make a fun edge! - Knot your floss. Holding your hearts together, pull the needle up from the bottom at the point at the bottom of the hearts. So your knot will be at the back and your needle with your thread will come up at that point. 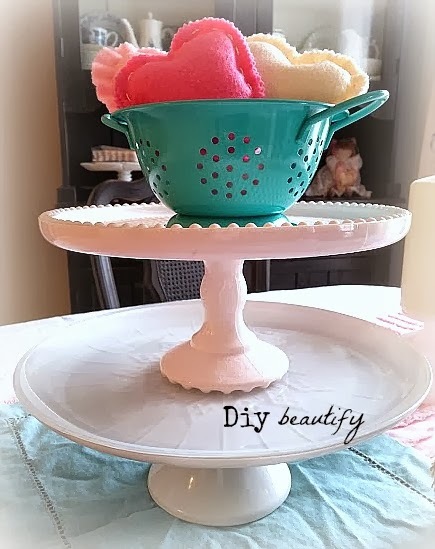 - Use an upholstery needle (it's larger and easier to thread your floss). Plus it's longer and you make several running stitches before actually having to pull the needle completely through. - Make big stitches. It makes it go quicker, lol! 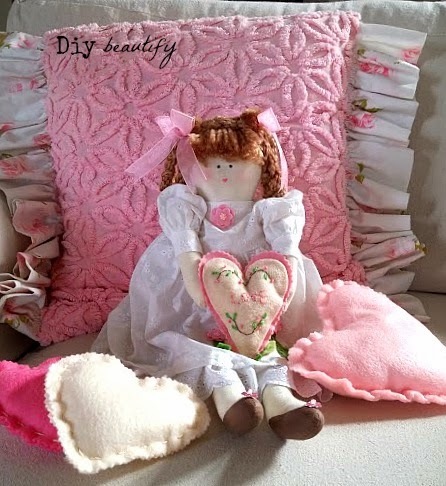 - Stop stitching just after you come around the second bump at the top of the heart. Leave your needle hanging and start stuffing. - You will need more batting than you think. Make sure to push it into the corners and even down to the bottom point; don't forget the center! When you stitch your heart closed, it should be good and full and you should have to hold it tightly with your other hand to keep it from popping open as you stitch. - Finish stitching down to the bottom point, with your needle point down through your heart so your thread ends up on the backside. Make a couple tight knots and you are done. Really cute project. I also love heart shaped items. I like to decorate for different holidays, but have little for Valentine's Day. I think I will do this with my niece. 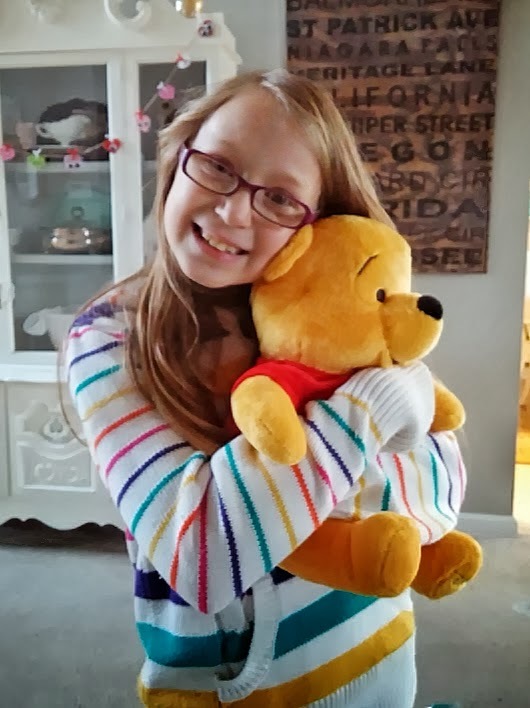 She is a budding seamstress! I am visiting from Coastal Home and am a new follower. I hope you have time to visit me at Still Woods Farmhouse. I am sharing a terrific Superbowl appetizer!